Have you lost some of the music files from your library of iTunes? Sometimes, these kinds of situations may be there for the users of iTunes. It may take a long time to create a good playlist or library of music files to iTunes. Therefore, you never want to face any kind of inconvenience due to deleted files from your iTunes account. There may be various causes when the users find such problem in iTunes. Now, you don’t have to worry about the recovery of deleted songs from your iTunes because you can recover it from any other iOS device by using iMyFone TunesMate. Do you know want to find the perfect way that how to recover deleted songs from iTunes? The complete process is very simple and quick by using the effective tool of iMyFone TunesMate. This tool is available as the perfect way for the recovery of your deleted music files from your iTunes. 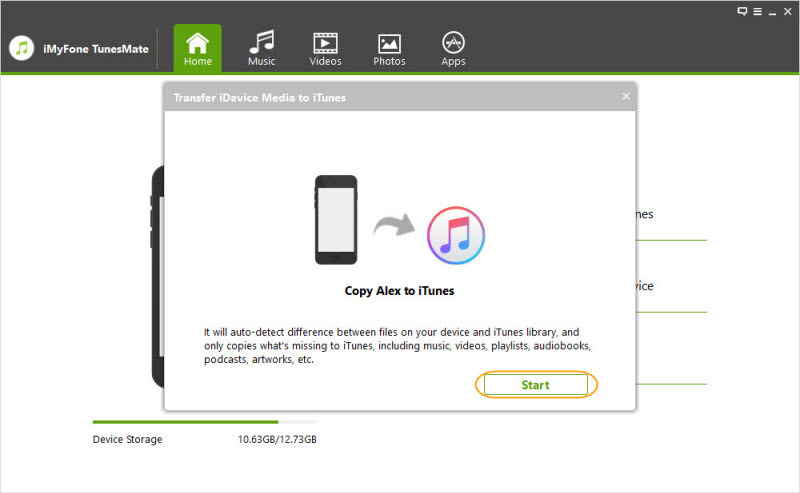 It provides the amazing features to the users who want to transfer the media files including music, ringtones, playlist, podcasts, audio books and much more from iTunes to iDevices or vice versa. Whether it is your iPod, iPhone or iPad, it will be easy to send the media files and music files with one tab without any kind of inconvenience between these devices. Transfer unlimited files from your iTunes to an iOS device. Sync process for iTunes library with your iOS device. Sync without overwriting the previously transferred data. Recovery of all media files including music, photos, videos, podcast, ringtones, playlist and much more. Now, you don’t have to face any kind of trouble to retrieve iTunes music in any device because of this effective tool. All these features are very beneficial for all the users who are searching for the perfect way to get rid of the headache of deleted music files from iTunes. Now, every iTunes user will be able to transfer the songs from iOS devices to iTunes to recover the deleted songs from the library. For the new users, it is important to follow the step by step process. When it comes to searching for the information about how to recover music from iTunes, just use the steps given below and get all the songs from my devices to iTunes. First, download the tool iMyFone TunesMate in your PC. Install the tool and run it on your computer. Connect your iPhone or iPad with USB connection to your computer. It will detect your phone, then clicks on the option “Transfer iDevice Media to iTunes”. Click “Start” button from the pop-up window to continue. You can check the music only and then click "Start" button to begin. Wait for the process to complete to get the desired music files on your iTunes. 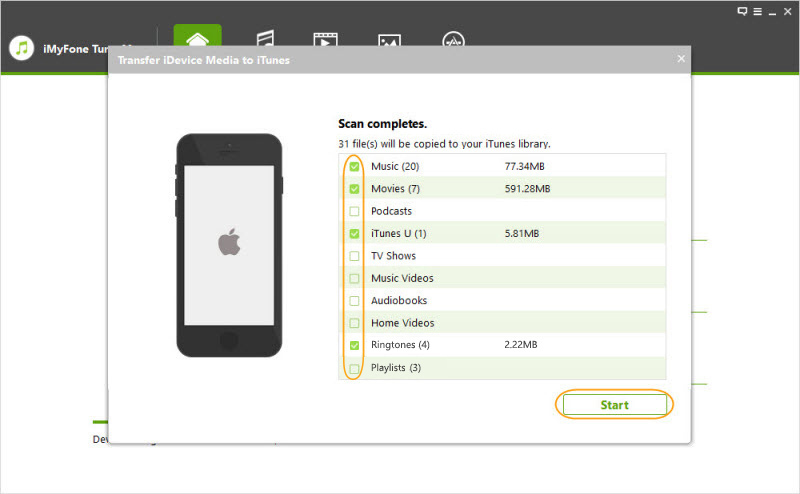 Just follow these simple steps and quick steps and get all the desired files in your iTunes. iMyFone TunesMate is very effective to provide a one-touch solution to complete the transfer of all the desired media files. Quit iTunes on your computer. Attach the external hard disk containing iTunes backup file. After that, open the folders of external hard drive and navigate to the backup file of iTunes. Just drag the folder containing iTunes backup file from external hard drive to your computer at the location created by iTunes. Open the iTunes and click "File > Add Folder to Library"option. After that, iTunes will automatically create the new library and will restore the files from backup. If you also want to know that how to retrieve music from iTunes, this process will be very helpful and quick for it. All the iTunes users can get the deleted songs back to iTunes by using the iOS device or backup file on the external hard drive. iMyFone TunesMate provides all in one solution to all the users who are looking for a complete solution to recover the deleted songs and music library in iTunes. You don’t have to go through any kind of the process because this tool is available to provide one-click solution to all the users who want music library back to iTunes or iOS devices.